We’re approaching the anniversary of the last major flood in Martinez. On January 1, 1997 the heavy rains caused flooding on Alhambra Creek, running through the heart of downtown. Turning to San Luis Obispo, a Central Coast city with similar creek issues, Martinez developed a restoration plan that would turn their creek problem into an asset and help maintain a beautiful riparian corridor through the town. They succeeded so well that the beavers moved in! The plump, sleek rodents with oversize front teeth live at the intersection of land and water. Beavers once existed in nearly every small stream in North America, including the Bay Area, but were hunted nearly to extinction by 1830. Second only to humans in their abilities to alter environments, beavers transform riparian ecosystems with their dam building skills. This led to their designation as a keystone species and “nature’s engineers.” With beavers at work in a creek, many more species are present than when beavers are absent. The flow device installed by Skip Lisle helps maintain beaver ponds at acceptable levels. Diagram courtesy of Worth a Dam. 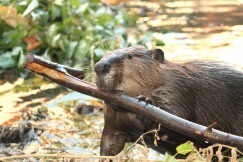 Perryman estimates that North American beavers are at about one-tenth of their historic population. “Allowing beavers to remain brings many other benefits, including huge economic benefits of free creek restoration. In a time when riparian habitat restoration costs are high, beavers do the work for free. They also control their own population with their presence. They tolerate only their own family group, which deters overpopulation in any one area,” Perryman added. 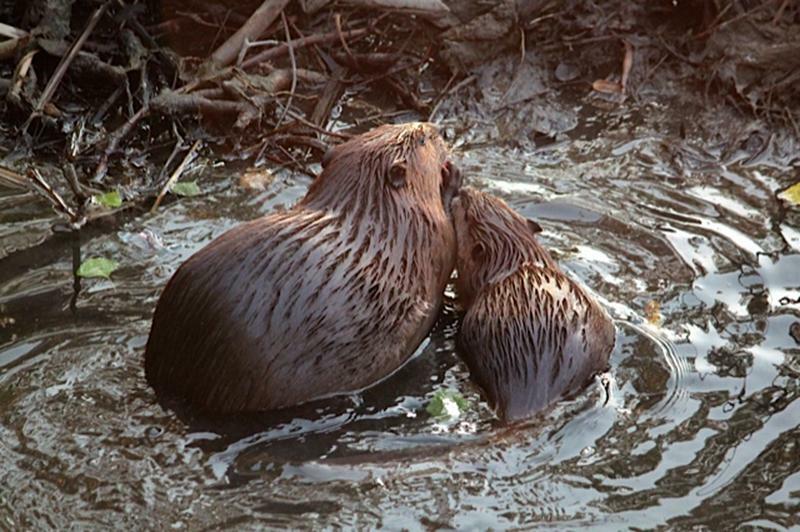 You can see a video describing how beavers are helping salmon and trout populations with their creek restoration work on the Oregon Public Broadcast website. Beavers are "nature's engineers" and a keystone species providing habitat for a diverse and rich ecosystem. Photo by Cheryl Reynolds, Worth a Dam. Check out the Beaver Mapper Project on the Riverbend Science website to see where beavers are found in our area. And you can visit the Martinez beaver dam for a chance to see the beavers at work. Mark Ross suggests taking an Amtrak adventure to reach the town, grab a bite to eat and stroll a 2-3 mile loop through nearby marshes and wetlands at Martinez Regional Shoreline to end up at sunset -- that's the best chance to see these nocturnal animals beginning their work. Volunteers from “Worth a Dam” are available to share their enthusiasm for beavers and knowledge, just email them ahead of time to arrange a meeting. “Worth a Dam” will also highlight Martinez beavers at the Salmonid Restoration Conference in March. Put the annual Martinez Beaver Festival on your calendar for next summer.